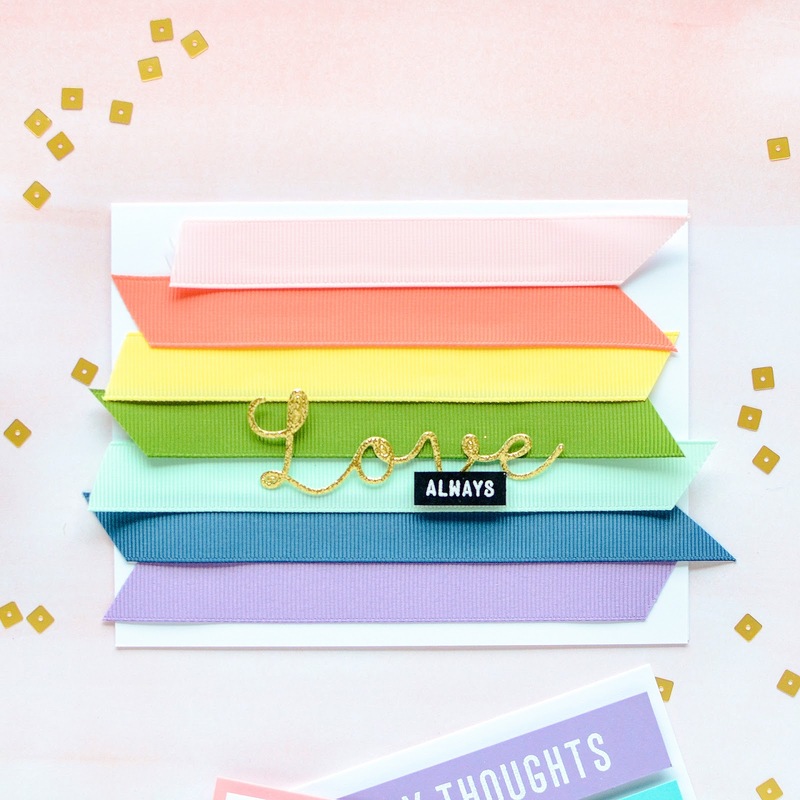 Papertrey Ink :: Design Team Tips: All the Rainbows! Hey there! I've got another Papertrey Ink Design Team Tips post today. Thank you for all the love you showed for my last one--I hope you guys find this one just as inspiring! In case you hadn't noticed, rainbows are getting a lot of love these days, and while it's taken me awhile, I'm fully embracing them. There are so many ways you can create them in crafting, too, even if you don't have rainbow-specific products. 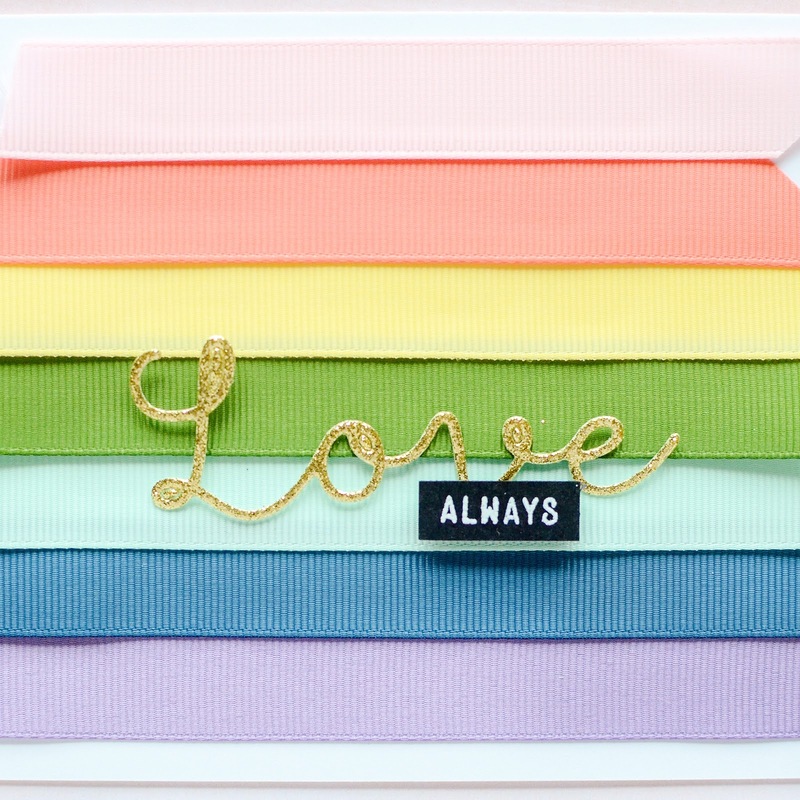 Everything from ink to paper to ribbon will help you make pretty, colorful rainbows. I've found I've been using many of the same color schemes lately so creating these rainbow cards helped push me out of that comfort zone, and you know, I'm really pleased with the results! I also found myself making a type of card that is also not my go-to, and again, it feels great to try something different! The first card I want to share is one that's been in the back of my mind for a long, long time, but for one reason or other, never had the chance to put it to paper. I'm glad I waited because it inspired all my projects today! 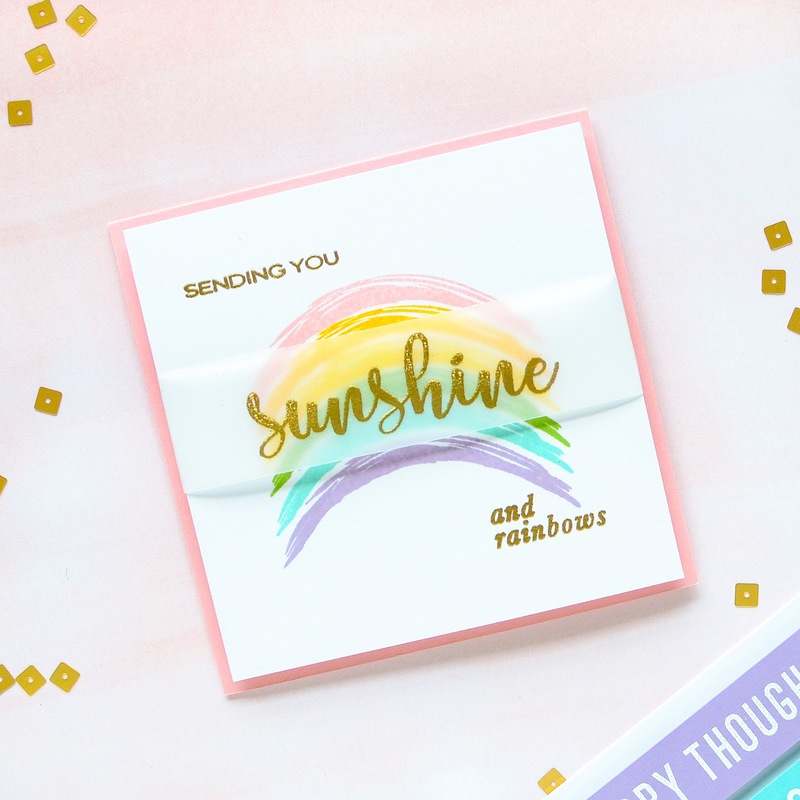 In my stamp set Yellow Sunshine, there is a curved paint stroke image that I used to create a rainbow. 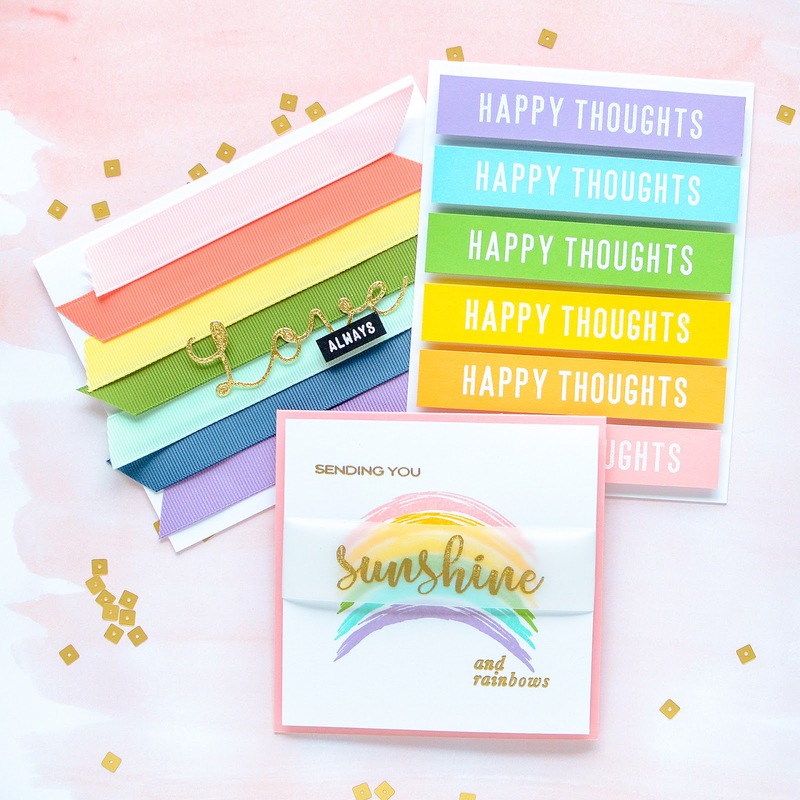 If you don't have this set, you can still make a rainbow by curving a line stamp (like the skinny string stamp featured in last months' post), or an actual stripe stamp. I stamped it 6 times in a multitude of colors--Pale Peony, Summer Sunrise, Bright Buttercup, New Leaf, Hawaiian Shores, and Winter Wisteria. Those colors together make such a pretty rainbow! Then I stamped 'and rainbows' from the same set in WaterMark ink and embossed the sentiment with gold embossing powder. 'Sending you' is from the set Sending Joy and I stamped and embossed that, as well. 'Sunshine,' shown with the same technique, was stamped on a thin strip of vellum paper and overlaid across the center of the rainbow. I folded the ends of the vellum around to the back of the card where they're adhered. Finally, I took my 4" x 4" designed panel and used 3-D foam dots to adhere it to a 4.25" square Pale Peony card. The next card is the one that took me out of my normal routine of white background cards. I mean, it still technically has a white background, but there are 6 strips of colored cardstock that mostly cover it so I'm voting it counts! 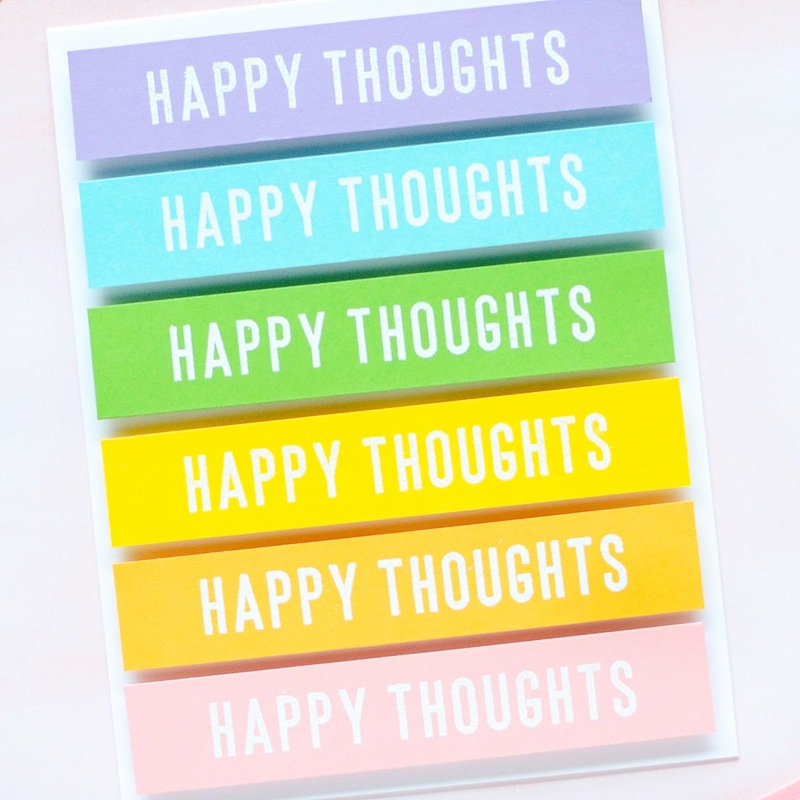 I took the sentiment 'Happy Thoughts' from Frame it Out: What's Inside and stamped it on 3/4" cardstock pieces. I used the same colors of paper as I used for my inks on the previous card. This card was really easy to create but makes a really big impact with all of those bright, happy colors. The strips are attached with 3-D foam dots to give it dimension, which helps make the card appear more dynamic. 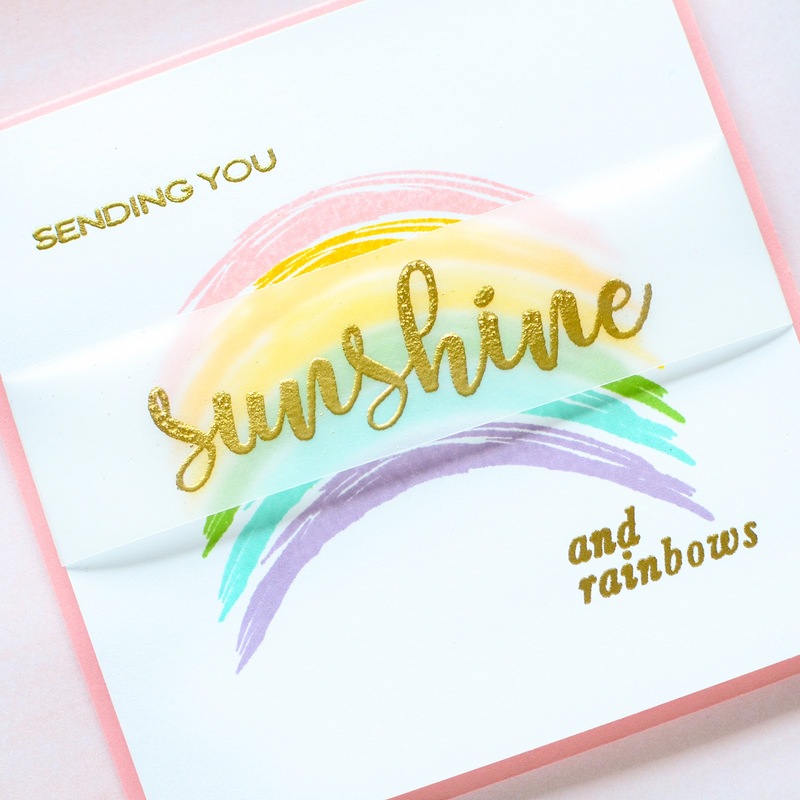 You can change out the sentiment for any occasion or choose different ink colors to create your rainbow and use this design over and over again--I know I'm going to! I cut a 'Love' sentiment from gold glitter paper and added a tiny white embossed 'always' underneath it. I chose gold, white, and black for the sentiments for contrast as I thought anything colored might blend in and get lost against the already-colorful background of this piece. 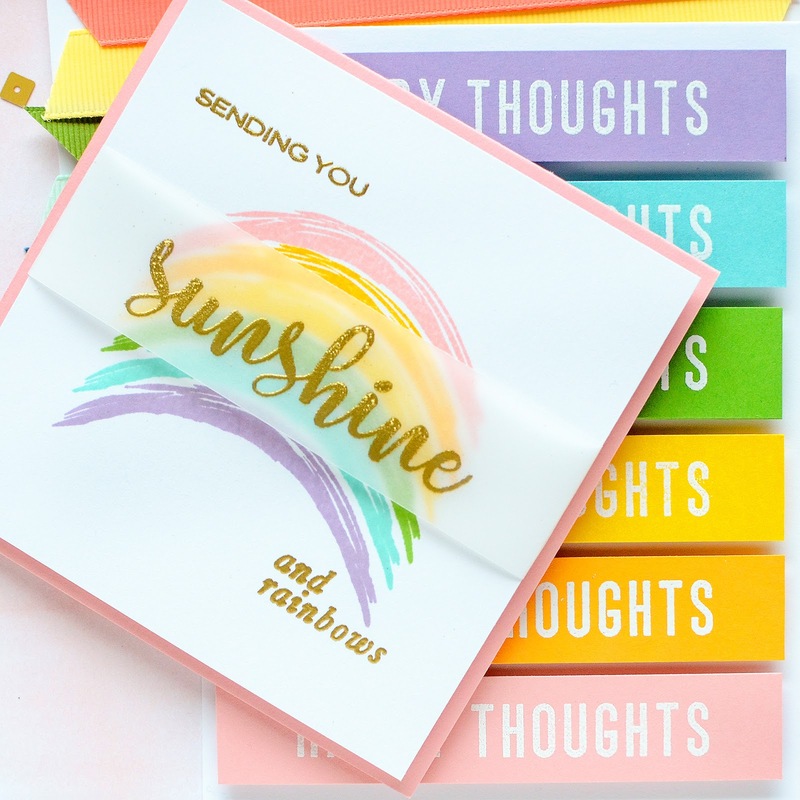 I think I could have gone on to create a hundred more rainbow-style cards if I didn't have to do silly things like clean my house or fold laundry, but unfortunately, 'life things' called me away from my crafty space before I had a chance. This is good start, though, and ended up being so inspiring for me; I can only hope you've also found these rainbow-infused cards inspiring. So pretty! You have inspired me to get out some fun colors & play! Love the curved rainbow card especially! Oh, thank you , Patti, and I'm so glad you've been inspired! Have fun!! Like you, I have never been a huge fan of rainbows, but your cards may make me change my mind. 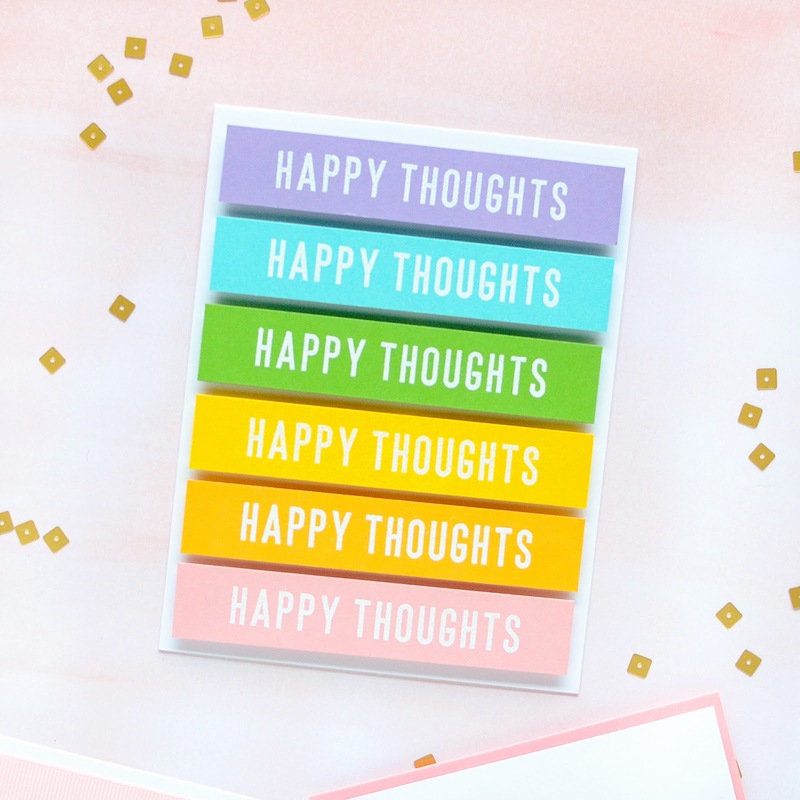 The 'happy thoughts' card is right up my alley! LOVE IT. Now, Roy G Biv, we might have to get acquainted. HAHA! I love that--getting acquainted with Roy G Biv!!! Love your cards. I think I need to make the “sunshine” card. Thank you for sharing Rebecca! Such a beautiful trio of cards, Rebecca! One can’t go wrong with any style of rainbows.